Why crutch when you can walk? Do you hate crutches? Why wouldn’t you? Crutches hurt your hands, wrists and underarms. But more than that, crutches (and knee scooters) make it impossible to do everyday tasks because you don’t have use of your hands or arms. The iWALK2.0 is the award winning crutch and knee scooter alternative for all below knee injuries. It gives you hands-free / pain-free mobility and gives you back the ability to live a functional, independent lifestyle. So now pushing a shopping cart, taking the stairs, walking the dog, going to work are all possible again. So why would you use an arm crutch, when a leg crutch works so much better? The new iWALK 2.0 is available to buy exclusively from us in the NZ for just $265.00 plus delivery – we are the sole authorised NZ distributor. Head to our simple, safe and secure online store to order your iWALK 2.0 and free up your hands! Normal crutches rob you of 3 of your 4 limbs – the iWALK gives you them back! Walking the dog, cooking, climbing stairs, opening a door, using the phone – all simple tasks that take on a whole new level of difficulty when you use conventional crutches. Is the iWalk suitable for you? For most people suffering lower leg, foot and ankle injuries, the answer is YES! – it is a great way to improve your qualify of life during your rehabilitation. That said, since every physique and every injury is unique, we recommend that you always consult with your health care professional before using the iWALK 2.0. Learning to use the iWALK2.0 crutch is easy, intuitive and safe. That’s because from the knee up, your leg is doing the same thing it’s always done. 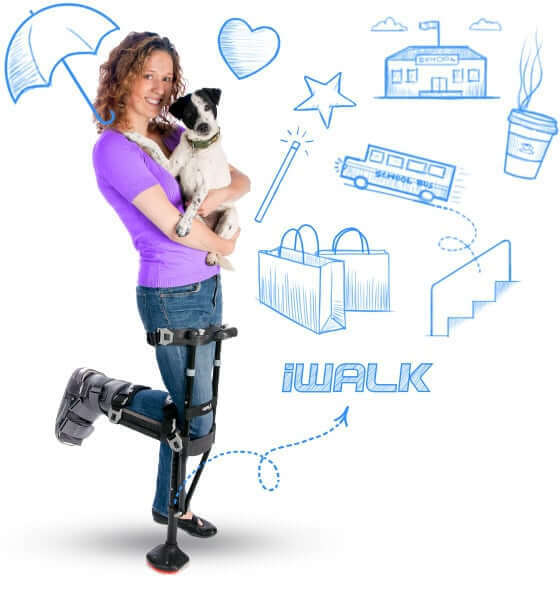 Think of the iWALK2.0 as a temporary lower leg, and you’ll see why you can be iWALKing in minutes! So get your life back right now. Try the amazing iWALK for yourself!